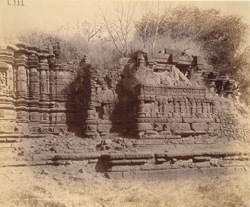 Photograph of the south side of the mandapa to the Maheshvara temple, Patan taken by Henry Cousens in the 1880s or 1890s. Patan was the capital of Gujarat until the eleventh century. The Maheshvara Temple faces east and consists of a sanctuary with a mandapa or hall and a porch. The hall is open and the pillars support the eaves standing on a dwarf wall. The exterior walls are very elaborately treated with deeply cut mouldings but there are not many sculpture panels. The only large images are set in the three principal niches around the shrine. This view shows the temple ruins, the shikara, now collapsed and the south niche with a figure of Mahakali. The tower over the sanctuary and the roof of the mandapa have disappeared.